Washington, D.C., had a long history of forcing African Americans to live in little square shacks wedged in between the back sides of homes of white Washingtonians. Eleanor Roosevelt became an unyielding advocate to end this housing discrimination in the District of Columbia. As honorary president of the Washington Committee on Housing, ER promoted its activities and used her press conferences, "My Day" columns, and public lectures to hammer away at the unacceptable housing situation of African American Washingtonians. ER not only addressed the existing situation but envisioned and worked for better alternatives. Finally, on June 12, 1934 the District of Columbia Alley Dwelling Act was passed, establishing the Washington Housing Authority as an independent agency. 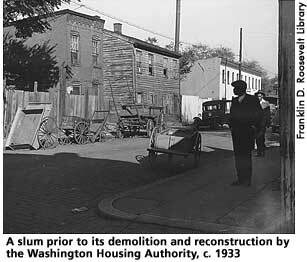 The WHA focused on eliminating slum housing in alleys near the Capitol and promoted quality, affordable housing. The WHA was redesignated the National Capital Housing Authority in 1943. Beasley, Maurine, Holly C. Schulman and Henry R. Beasley, eds. The Eleanor Roosevelt Encyclopedia. Westport, Conn.: Greenwood Press, 2001, 137-8. Cook, Blanche Wiesen. Eleanor Roosevelt: Volume Two, 1933-1938. New York: Penguin Books, 1999, 348. "Legends in the Law: A Conversation with Charles A. Horsky." Bar Report. August/September 1996. Internet on-line. Available From http://www.dcbar.org/about_bar/Charlesa.html. Records of the National Capital Housing Authority. History. Internet on-line. Available From http://www.nara.gov/guide/rg302.html.